Department of Homeland Security Secretary Kirstjen Nielsen speaks to the local news media against the backdrop of the border wall Wednesday, Dec 13, 2017, in Hidalgo. Nielsen toured parts of the border and spoke with local government leaders during her visit. 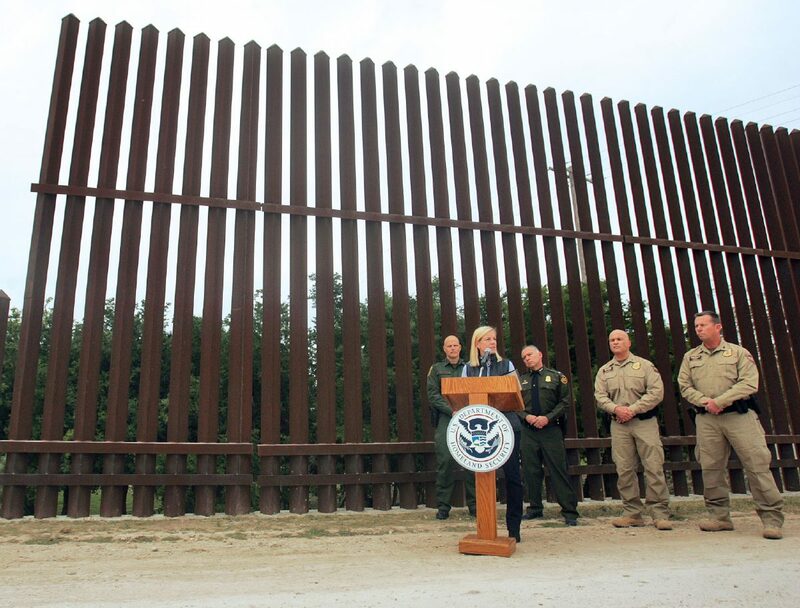 Federal officials have approved another border wall contract, this one for the $167 million construction of 8 miles of levee wall system in the Rio Grande Valley. Awarded Nov. 11 to Galveston-based SLSCO, the project dubbed RGV-02 consists of construction in the Hidalgo County cities of Alamo, Donna, Weslaco, Progreso and Mercedes, according to a U.S. Customs and Border Protection news release. Reinforced concrete levee wall will be constructed to reach the height of the existing levee in addition to steel bollards measuring 18 feet high being installed atop the concrete wall. CBP, which awarded the contract along with the U.S. Army Corps of Engineers, also detailed the removal of area vegetation located along a “150-foot enforcement zone” throughout the 8 miles where construction is planned. The U.S. government awarded the first contract, which has a $145 million price tag, to SLSCO earlier this month for 6 miles of construction along the levee wall system. Referred to as RGV-03, the first project confirmed by CBP lies within the McAllen station area in Hidalgo County, and consists of similar construction announced for RGV-02. Construction for both border wall projects, which will include “detection technology, lighting, video surveillance, and an all-weather patrol road parallel to the levee wall,” is scheduled to begin in February 2019. But local property owners and representatives of natural habitats and preserves have long expressed concern that the construction of a border wall near or through their land would either disrupt or destroy their history or ways of life, from historic cemeteries where some of the Valley’s pioneering families now rest along with American veterans of wars dating as far back as the Civil War, to state parks and centers that help attract millions of dollars in ecotourism to the area. Today, Defense Secretary Jim Mattis and Homeland Security Secretary Kirstjen Nielsen are inspecting troops camped at the U.S.-Mexico border as part of President Donald Trump’s efforts to secure the border amid reports of a caravan of Central Americans seeking asylum in the U.S.